Of all the people to invest in safeguarding their family’s financial future and therefore their lifestyle, Aegon reported in 2015, “Only 6% of UK life-insurance policies are written in trust”. For those who don’t, it’s the beneficiaries who are left to deal with the consequences, defeating some of the benefits of the life insurance policy in the first place. Why this matters for life insurance is because of tax. Even when you die, you don’t escape tax. It’s called Inheritance Tax (IHT) and when your collective assets – money, shares, possessions and property – also known as your “estate” reach a pre-determined amount set by HMRC, the beneficiary/beneficiaries of your estate can be liable for paying IHT off the sum of your life insurance payout and any other financial benefits they receive as a result of your passing. Life insurance providers can write your life insurance policy into trust without any additional cost, but it’s a very wise move on your part to get legal advice before doing so, because once in trust, it can’t be changed, nor can the named beneficiaries be altered. As SimplifyTheLaw.co.uk put it, “once a trust is set up, it has a life of its own.” It’s a one-time set up that needs careful consideration. And it’s a lot more complex than naming someone as a beneficiary. What you’re doing with a trust when you do it with some solid advice is planning for the financial certainty of your family’s lifestyle. Without a trust, your life insurance forms part of your overall estate. Setting up a trust is part of financial planning to separate different entities within your estate, which can serve to prevent potential costs to your named beneficiaries being triggered. This is the main reason for writing your life insurance into trust. It separates the lump sum payout from the rest of your estate. With it in trust, you could have a £250,000 life-insurance payout to your named beneficiaries and a home valued at £250,000 treated as two separate entities, therefore keeping your beneficiary’s inheritance under the threshold (currently £325,000). If it were to be treated as a single entity as your entire estate would be, it would be valued at £500,000 triggering a potentially high IHT bill costing the beneficiary 40% of your estate. There may still be some tax to pay, but not nearly as much as your entire estate would be if it weren’t written in trust. The current rate is 40%, however, if your entire estate is likely to be over the threshold, leaving 10% to charity can trigger the lower IHT rate of 36% – which is still a lot of money off your families payout – but it’s still a something of a saving, with added generosity thrown in. If you’ve ever been the named executor of an estate, you’ll know about Probate or the Grant of Representation. For those who haven’t had to deal with the financial affairs of a lost loved one, when someone dies, the executor of his or her estate has to apply for Probate or the Grant of Representation (in Scotland, it’s called Confirmation), before they’re able to carry out their duties of sorting through the financial affairs of the person who died. That can take some time. That’s even if you’re a named person on a Will. If there’s not a Will in place, it’s considered as Intestacy and will take even longer to obtain a Grant of Representation to sort out the person’s affairs and be issued with the amount specified in a life insurance policy. However, with a trust, all that’s required (in most cases) is the life insurance provider to be supplied with a copy of the death certificate for them to be able to get the payment of the full amount of the payout paid. It’s by far the fastest way and the most convenient method for beneficiaries following bereavement to get the legal process moving along smoothly. Without a trust, it can be a long and drawn-out process. Often is the case that you don’t have one beneficiary. You might have three children, each with children of their own for whom you want each to get a share of your estate. With a trust, you can specify who gets how much and the terms and amounts. In the case of children, you can name a trustee as an appointee to take care of the funds until your grandkids reach the age of 18. The only way to ensure your family retain as much of the payout from a life insurance plan, or multiple if you’ve more than one plan in place, is to set up a trust, which will act as a legal entity to break up your estate. It can act as an effective circumvention to inheritance tax, and provide you with greater control over who gets what shares of the payout you’ve arranged with a life insurance provider and specify the terms within your trust, such as having someone act as an appointee of an amount left to a grandchild, or someone without capacity. The life insurance provider pays the amount specified in your policy. Your trust determines what happens to the money that’s paid out by the insurer. Poor financial planning of the life insurance policyholder leaves the beneficiaries vulnerable to IHT and lacking insight into how to divide the payout as you’d have wished. Plus, it can slow down the process if a trust isn’t in place. 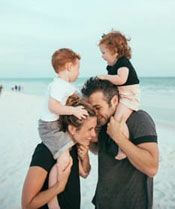 When you’re ready to make the financial arrangements for your family, it is well worth taking the time and the legal advice necessary to get things done properly. Financial firms can write your life insurance into trust using standard trust packs, such as what’s detailed on Legal and General’s Trust information page here. The drawback you have with standard packs though is that they lack the individual element that’s needed to ensure your personal needs are met. To ensure your personal circumstances are catered to in the trust, it is highly advised to get legal advice. That’s the only way to make certain the trust you put into place is tailored to your unique situation. When done right, it’ll save your family a potential fortune and help things to go much more smoothly with a trust in place, than it will be for them without one.